First, as part of our coffee price forecast 2019 we look at supply / demand situation. The supply / demand picture in the coffee market is pretty straightforward: rigid supply situation combined with an inelastic demand. In other words, it is pretty tough to increase/decrease supply and consumers will not drink more/less if the coffee price changes. It makes for a simple equation. What this report highlights is the impact of falling coffee prices on the coffee producers, so essentially the human factor. It also confirms that supply is high, too high as it relates to price. The Daily Coffee News published somem insights on the dynamic of a global price crash in times of oversupply which is how we would characterize today’s situation. The current state of a 2.58 million bag surplus seems both correct and fair: if there is too much product for the global demand then it will always receive a lower price. However, the report points out that the issue face is that the inelasticity of demand and the fixed nature of supply leaves millions of smallholders unable to adapt and quite literally at risk of starvation in the fallout of major downward movements. So far it seems that the sources we found on supply/demand are reliable, detailed and confirm each other. We did not find specific trigger to make us think that supply is subject to a decline in the short to medium term. However, there is a clear indication that today’s situation is unsustainable, so there will probably be a natural mechanism that kicks in at a certain point. We simply cannot forecast when and how this would lead to lower supply levels. From a totally different perspective, but probably more impottant for our coffee price forecast 2019, is the intermarket dynamics that are there in the coffee market. There seems to be a strong correlation between the Brazilian currency Real and the coffee price. ABN Amro takes adds a very interesting perspective on this point which we consider an ‘intermarket effect’. 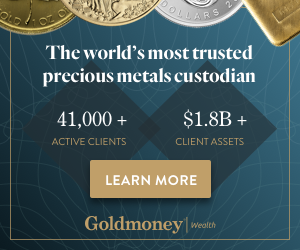 Similarly, Bloomberg adds to this that the weakening of the Brazilian real and the Colombian peso against the dollar also played a role in the drop by encouraging local farmers to sell more of their coffee, which is usually priced in the greenback. So did the worst decline in commodity prices since 2015 amid rising interest rates in the U.S.
As we check the Dollar to Brazilian Real long term chart we see that the Real indeed arrived at a very important point: triple resistance. Moreover, with the U.S. Dollar showing signs of an intermediate topping pattern, as explained on our dominant trend monthly review we tend to agree with ABN Amro that the Real might appreciate against the U.S. Dollar in 2019. We first want to see a breakdown in the USD/Real currency pair shown below. It is an absolute condition before putting capital at work in the coffee market! The trend in speculator positions (‘Commitment of Traders’) also has a strong impact on coffee prices. 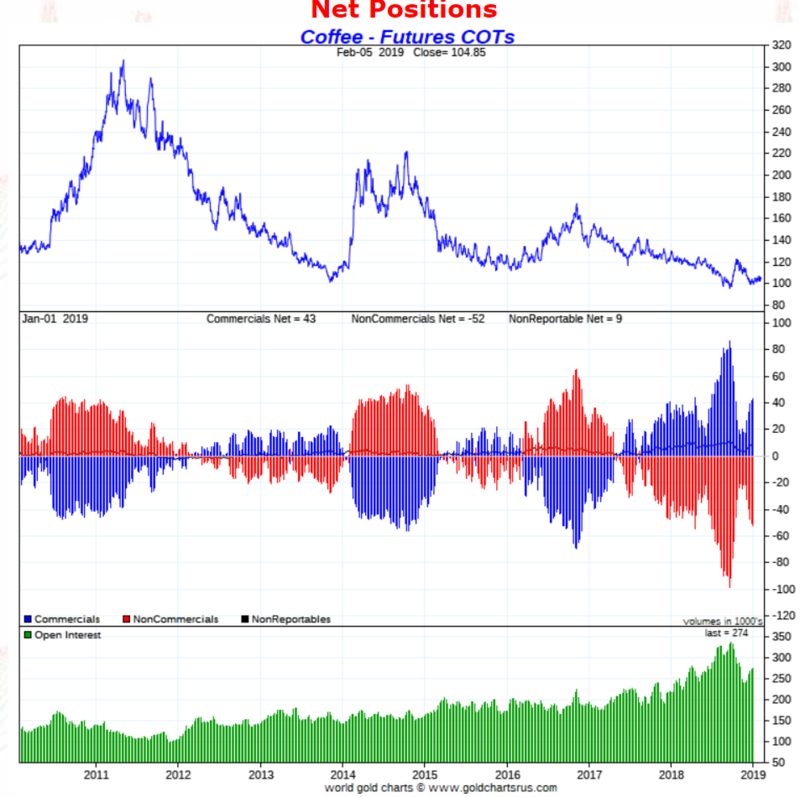 The number of short positions has declined sharply since the end of September on short covering. This means that speculator sentiment regarding the coffee price has improved and speculators assume that the price pressure on coffee will decrease. This is largely based on the expectations concerning the Brazilian real and a stronger demand for coffee at the current relatively low price. When we look at the 9 year COT statistics, especially the center pane, we see an abnormal situation. The amount and time that commercials are long is unusual. It has happened before in the past, but not as long and as heavy as in 2018. These are the type of extreme futures market situations that will not last forever. It will adjust, likely together with a strengthening Brazilian Real. The long term coffee price chart has an extremely enticing setup. It has a giant triangle pattern which will resolve in 2019, without any doubt! The million dollar question is in which direction? The price of coffee is moving to its apex. It is a matter of a few months until this resolves to the upside or downside. The odds favor an upside move. We have seen violent moves to the upside of coffee as indicated in green. Note that coffee tends to move aggressively higher every 2 to 3 years. That’s why smart investors are ready to get in fast once this breakout occurs, timing will be crucial. If there is one thing we know from the past is that coffee moves ultra fast higher once it starts trending (read: once it breaks out). So it will be of the highest importance to stand ready and act fast, if and when a breakout takes place. The reasonable high we envision after a breakout on Brazilian Real strength is 2 USD because of the chart structure shown below. With all this said we believe that 2 USD might be a reasonable price target for our coffee price forecast 2019. Note this is NOT an average price for 2019, it is more of a peak we expect.